To compete in an era of globalization and fast-moving business change, organizations need to apply smart technologies, which can reduce costs, increase scalability, improve accuracy, boost speed and make better use of human efforts. Businesses today exist in an era of globalization, hyper-competitiveness and ever-accelerating business cycles. To succeed in this environment, many enterprises are focusing on the top-level objectives of reducing operational complexity, increasing agility and speeding innovation while lowering the associated costs. 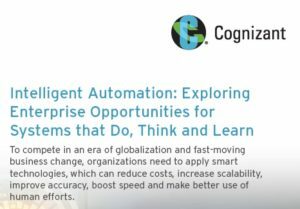 Of all the various levers organizations can pull to achieve these goals, smart technologies — which we call intelligent automation — are among the most versatile and effective. Opportunities abound for applying intelligent automation (see Figure 1). In many organizations, multiple processes continue to require manual workarounds, which results in smart people spending their time on limited-value, rote and repetitive manual process steps. These processes can be found in back offices, processing centers and anywhere else that an interface has been built between legacy and digital front-end applications. Compared with many other approaches — such as wholesale system migrations, new ERP solutions or even many process re-engineering efforts — intelligent automation can be implemented quickly, with limited cost. The value of intelligent automation includes reduced cost, increased scalability, improved accuracy and consistency, faster processing, better use of human efforts, improved compliance and audit trails, and faster ROI.